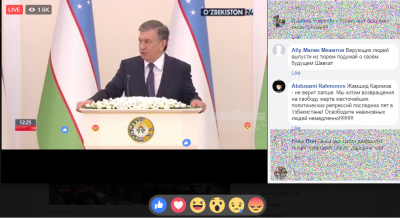 Mirziyoyev's four-hour address. Photo from presidential press service. 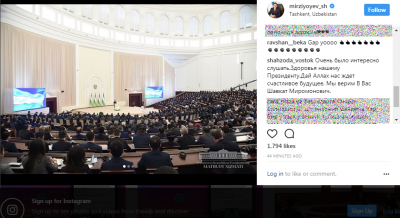 Easing the lives of ordinary people and doing battle with the outsized post-independence successor to the KGB topped the agenda in a four-hour state of the nation address  given by Uzbekistan's President Shavkat Mirziyoyev. The marathon address earlier this month was the most recent attempt to portray Mirziyoyev as the good cop in a country full of bad ones. Mirziyoyev, 60, came to power in September last year on the back of long-reigning despot Islam Karimov's death. His predecessor's reign of nearly three decades began when the Central Asian country was still a Soviet republic and saw the country regularly rooted to the bottom of global human rights rankings. Uzbekistan was best known for systematic torture , including boiling, and forced labour  in the country's cotton fields. Following a pro-forma election three months later, Karimov's stern-faced former prime-minister of more than 13 years cemented his position at the top of the authoritarian country's political elite with a simple message: things must change. He has reiterated it ever since. People want to see changes in their lives today, not tomorrow, and not in far future. Our hard-working, kind-hearted and generous people have a right to it. 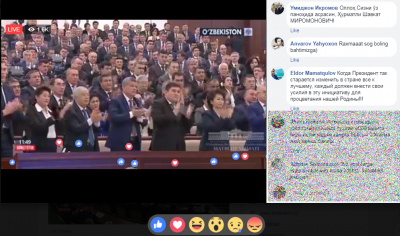 The live stream of Mirziyoyev's December 22 annual address was peppered with likes from Uzbek Facebook users as a sea of state officials broke into waves of applause at regular intervals. “Thank you. 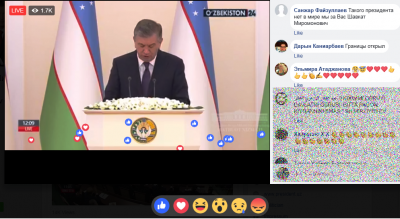 Be healthy and safe,” read one comment on the Facebook live of Mirziyoyev's speech. “When the President tries so much to change the situation in the country, everyone should contribute to this initiative”, read another. While subservient officialdom was a trademark of the Karimov era, live streaming certainly wasn't. The change in form has been accompanied by some changes in substance. From freeing political prisoners  to ordering the removal of unpopular foreign travel  and currency exchange  restrictions, Mirziyoyev has already undone many of Karimov's signature policies. Perhaps most notably, he has also acknowledged forced labour  in the country's lucrative cotton harvest that once saw tens of thousands of schoolchildren along with teachers and state medical sequestered into work as pickers. But he initiated these changes while keeping the authoritarian system intact and continuing to publicly revere Karimov, who remains the father and founder of independent Uzbekistan. 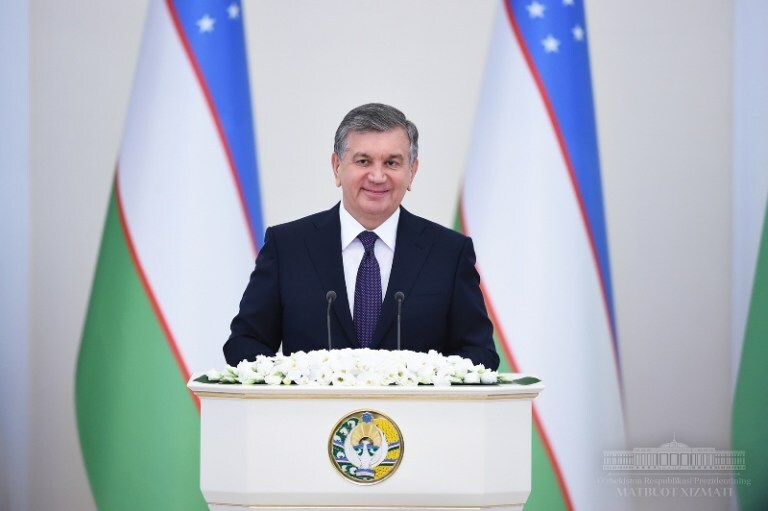 For instance, according to Reuters, Mirziyoyev blamed unspecified “economists” during his speech for faking economic data  throughout Karimov's time in charge. Eight percent (GDP growth) was fiction. To be frank, I ordered the 5.5 percent figure [for 2017] to be checked almost 10 times! In 2017 we have created 336,000 new jobs and this is a real figure. Before, we used to report creating nearly a million jobs annually. No country in the world can do it! “Shavkat Miramonovich, we all are for you. There is no president in the world like you are!” one commenter said. Facebook  is not the only place where the new president is present. His channel on Telegram , the most popular messenger app in Uzbekistan, has more than 82,000 followers, and his Instagram  channel is being followed by 240,000 people. (Oddly he has yet to open official accounts on either of Russia's two biggest social media platforms, VKontakte and Odnoklassniki, despite their popularity in the republic). Mirziyoyev has also created new tools for generating feedback on government policies from the population. Шавкат Мирзиёев: “Ўзбекистон Республикаси Президентининг Халқ қабулхоналари ва Виртуал қабулхонаси фуқароларнинг мурожаатлари билан ишлашнинг ўзига хос демократик институти сифатида амалда ўзини оқламоқда”. Virtual reception of the President of Uzbekistan has turned into a kind of a democratic institute for dealing with citizen’s appeals. Шавкат Мирзиёев: “Шу муносабат билан мамлакатимиз фуқаролари давлат ва жамият ҳаётига дахлдор муҳим масалалар бўйича ўз фикрларини билдиришлари учун Интернет тармоғида “Менинг фикрим” деб номланган махсус веб-саҳифа ташкил этиш мақсадга мувофиқ”. It was important to create the new website “My Opinion” to let citizens express their views on important issues on state and society. But even as the Uzbek leader casts himself as a figure for the future — 2018 is set to be the Year of Entrepreneurship, Innovations, and Technologies — he will be forced to address at every turn the country's ugly recent past and present. In particular, Mirziyoyev has set himself on a collision course with the SNB (KGB successor) national security service, often described as a state within a state, by calling  for the service's reform during his speech. He has also ordered authorities to leave businesses be, rather than engaging in the constant checks known to help corrupt inspectors line their pockets. But beyond elite infighting, he must deal with increased expectations of government as a generally downtrodden citizenry uses the new voice it has been given to demand more changes faster. In terms of human rights for instance, Mirziyoyev has been credited with releasing key political prisoners who saw their terms arbitrarily extended. Yet his regime has jailed others, leading to talk of a “revolving door” in the country's jails. In a development unimaginable during Karimov's time, some Uzbek Facebook commenters found the courage to ask Mirziyoyev to improve religious freedoms and free people imprisoned on bogus extremism charges. Others demanded he curb inflation. One area where he can do no wrong for the moment is foreign relations. The indomitable Islam Karimov fashioned frosty and sometimes dangerously hostile relationships with all Uzbekistan's regional neighbours. Mirziyoyev has changed that, resolving border disputes  with Kyrgyzstan and resuming flights  to Tajikistan after a quarter of a century. He may yet endorse the construction of hydroelectric dams in both countries, projects Karimov strongly opposed. But whether at home or abroad, introducing changes is the relatively easy part. Seeing them though, and coping with any fallout and resistance along the way is far more difficult. For Uzbekistan, 2018 promises to be another very interesting year.